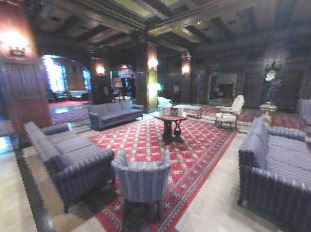 The Main Lounge is 99 feet square and is divided into thirds. 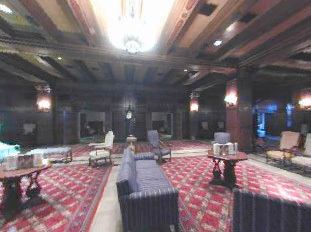 The side walls and columns, including the arches separating the colonnades from the lounge, have wood wainscoting from floor to ceiling. This creates the English type of living room so well known for its comfort and beauty. The oblong area in the center is arranged in four different conversational areas. The treatment of each is in the Jacobean era which creates a home-like feeling for the members with an environment of refinement, comfort, and beauty. It also expresses a spirit of welcome and club hospitality to out-of-town members. 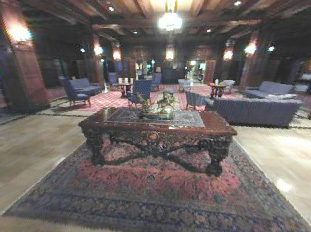 In the center of this oblong area is one of three hand-carved tables imported from Belgium. The six chairs along the south wall contain unique three dimensional carvings. On the south wall is a grandfathers’ clock that is one of seventeen known to have been crafted by the Herschedes Clock Co. of Cincinnati. Across from the clock is the bronze statue of a knight, Pierre Terrail, Seigneur de Bayard (1473-1524). He was a French military hero known as the fearless and blameless knight. It is mounted on a stone block from Arizona. The windows on the east side of the lounge are dedicated to the arts and sciences: (from north to south) engineering, electricity, sculpture, architecture, art, music, law, and medicine. They were created by the Von Gerichten Glass Company of Germany and Columbus, Ohio, where they were assembled and then installed in 1929. The art glass windows on the west side of the lounge were made by the Willet Stained Glass Studio of Philadelphia and installed in June 1975. Each contains a scene relating to the degrees from the 4th through 18th and the 32nd. They were donated anonymously in memory of four distinguished 33rd Degree Masons: George L. Clark, Ralph Hamill, Guy L. Roberts, and Oswald A. Tislow.